The Gioi (World) Publishers yesterday issued a new book entitled Arts of Vietnam 1009-1945, the first history to be published in English of the development of the arts throughout Vietnam. 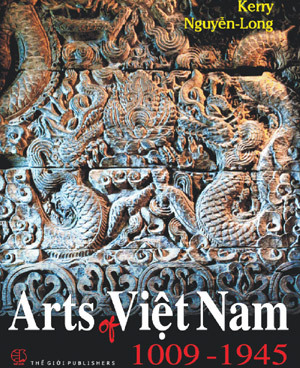 Hidden charm: The newly released Arts of Vietnam 1009-1945 chronicles the development of the arts throughout Vietnam. Australian author Kerry Nguyen-Long said the book gave voice to the work of Vietnamese scholars which has long been “locked away” in Vietnamese books and journals. Nguyen-Long said she drew on decades of research as well as recent discoveries of artifacts, records in family genealogies, and historical accounts. Nguyen-Long said she nearly cried when she read false or inadequate information on Vietnamese art which may have diverted readers’ attention from Vietnamese art altogether. It wasn’t worthy of the thousands-year history of art in Viet Nam, she said. With over 300 illustrations, the publication fills the need for a book on a long-neglected subject and cuts across entrenched and outdated views. Most of the photos in the book were taken by the author’s husband, Nguyen Kim Long, who also travelled to many places to collect materials and helped his wife translate as she knew little Vietnamese. The book introduces major categories of the arts from architecture to painting, presents them in historical context, describes their features in each period, and explains why, alongside enduring continuities, new styles emerged while others were abandoned. It also explains different craft techniques and sculptural styles in different periods, as well as esoteric symbolism and its evolution across the millennium, and responses to the introduction in the 20th century of the concept of fine arts. The author has a long connection with Vietnam and has been writing on its arts for decades. Since 1999 she has been a contributing editor of the international bimonthly magazine Arts of Asia, published in Hong Kong, in which she writes on the arts of Vietnam. Her work has also been featured in books, arts magazines, museum catalogues, and journals. The book was supported by the Australian Embassy as part of its programme to celebrate the 40th anniversary of diplomatic relations with Viet Nam. Phillip Stonehouse, Australia’s deputy ambassador to Vietnam, said he realised at first sight that Arts of Vietnam was a beautiful and important book. The book is available at bookstores at a price of VND1.2 million (US$60).